Tomorrow is Father’s Day and so many of you will be celebrating the day outdoors at the pool while lighting up the grill. Here in Missouri the weather is hot and humid and nothing hits the spot better than something nice, cool and refreshing. So to go with your burgers, steaks, chicken, fish or whatever entree’ you’re preparing it’s always nice to have a chilled salad and fresh squeezed lemonade or limeade to go with your meal. 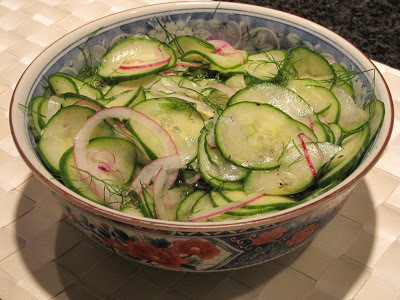 I love cucumbers so I thought I’d share with you a Pickled Cucumber Salad. It’s so nice and light plus very refreshing. Perfect on a warm summers day. In addiion don’t forget to try out the Ice Cream Casserole that I posted the other day. They’re both sure to be a hit at your bbq tomorrow. I hope everyone has a wonderful time with their dads and grandfather’s. This Pickled Cucumber Salad is perfect on a hot summers day! 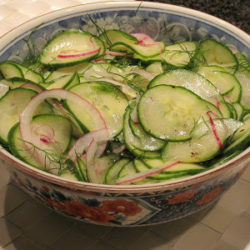 Place cucumbers on a rimmed baking sheet; sprinkle with salt. Let stand at room temperature for 2 hours. Drain. Whisk vinegar and sugar in a large bowl until the sugar dissolves. Add cucumbers, dill (or parsley) and onion, if desired. Season with pepper; toss to blend. Place in refrigerator for 2-8 hours for the flavors to meld. Transfer to serving dish and serve. Note: The photo of the salad above is 1/2 the recipe that's posted.